perform "Battle Hymn of the Republic." 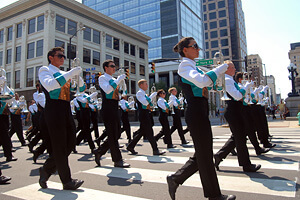 Drum Corps International and members of the local Indianapolis arts community took to the streets of the Circle City with gusto on Saturday, Aug. 13, for the first-ever Celebrate Indy Arts! Parade. 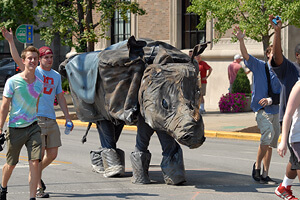 Just a few groups short of having as many marching music ensembles on the parade route as the Tournament of Roses Parade and Macy's Thanksgiving Day Parade combined, The Celebrate Indy Arts! 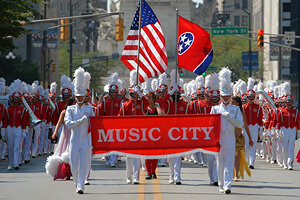 Parade featured all non-finalist DCI corps and a variety of local Indy groups. 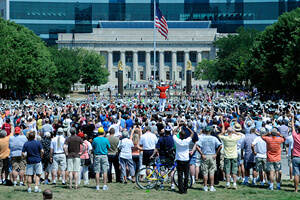 Wrapping up on the American Legion Mall, all of the participating drum corps assembled to play "Battle Hymn of the Republic," conducted by Major Brian Dix of "The Commandant's Own" U.S. Marine Drum and Bugle Corps. 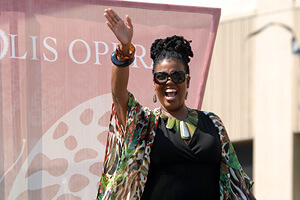 Judged by Drum Corps International Hall of Fame members and local dignitaries, several awards were given out to both the corps and the Indianapolis arts groups. 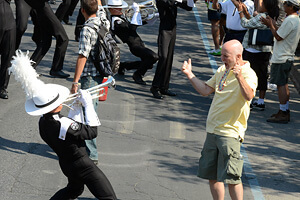 Drum corps fans and local residents' reaction to the parade. on the Indianapolis Opera float.